While getting my daily dose of Mashable this morning, I learned about a freelance journalist’s use of Kickstarter to help her raise funds to support her stay in Libya to continue reporting on the stories of the revolution on the ground. Zach Sneiderman, the post’s author, wrote that this journalist has partnered with Small World News, a new media company that helps train and provide tools to citizen journalists, and she is now spending 10 hours every week training Libyans on how to find, film and report their own stories. So I decided to check out SmallWorldNews.TV. Having lived the last month in an LA to NYC transition, I may have missed a lot in the “tech for change” news. But in case you missed it too, this is a site worth checking out. SmallWorldNews helps train citizen journalists in Libya, Egypt, Iraq and Bahrain to cover events their from the ground and through their eyes. What originally started as a Speak2Tweet service (years before Speak2Tweet launched), posting the voice recordings and videos from people in Iraq and Iran, has recently expanded to Libya and Egypt. Working with volunteer translators to add English subtitles when possible, SmallWorldNews then posts videos submitted from citizen journalists onto their site for anyone to view. Giving the entire world access to what the revolution looks like on the ground, not just on CNN. While we in the U.S. just have to deal with the extreme biases of FOX and MSNBC, millions of people around the world are getting their news information from limited, government controlled and censored media outlets. While I doubt that every Libyan is tuned into SmallWorldNews every day, I think that the efforts of this organization will have a much larger impact in the long run. These revolutions will eventually pass and new governments will be constructed, and people will feel empowered to keep a close eye on their new government and keep their people informed. And the rest of us around the world are benefitting, as we will have more options for consuming unfiltered news! Check out their current projects below. P.S. I’m really interested in the use of mobile phones for citizen journalist report dissemination. If anyone out there has heard of any organizations working on this, please message me on Twitter! As a native New Yorker, this video grabbed my attention and kept it. Enanced by a wonderful Yann Tiersen track from one of my favorite films, Amélie. From Luke Rudkowski and WeAreChange.org. I’m happy to say that I’ve spoken to strangers on the subway more than a handful of times. I dare you to try it next time you ride! Well, my goal of blogging once a week on online tools for social change lasted just one week…fortunately I have something you all should know about, so I am back on the wagon! Although our official screening campaign for The Last Survivor won’t officially launch until April, some screenings have already begun. So we decided to release our action video player, also known as a “Spark,” today! Special thanks to Call2Action for building this for us. What is so great about this video player is that it not only plays the trailer on any website, blog or Facebook feed, but without leaving the site you are watching it on you will find actions to help prevent genocide, work with refugees, or bring the film to your community. Just click on the “share” tab to grab the code for your blog. Click the Facebook icon and the video will drop right into your status update. Your friends will be able to watch the trailer without leaving their Facebook homepage! I have visited Israel many times. 14 to be exact. I love Israeli people and culture and have often considered making Aliyah (hebrew meaning “ascent” – referring to one’s desire to move to a holier existence – to Israel). I remember the first time I saw an Ethiopian Jew. It was 1989, I was three years old, and my parents brought me with them to the Maccabiah Games in Israel. Naturally, as a naïve 3-year-old, I wondered to myself, “How can these black people be Jewish?” I just didn’t know any better. I later learned that the Jews of Ethiopia were considered one of the lost tribes of Israel and fought desperately to return to the Holy Land to be amongst their Jewish brothers and sisters. Furthermore, their emigration to Israel was not unlike Adam Bashar’s arduous journey from Sudan to Egypt to Israel. This incredible parallel converged for me this past Sunday, March 13th, in New York, at the home of an old friend, Joey Low. Nine years ago, Joey Low, a long-time friend and generous donor to The Last Survivor film, started an organization called Israel at Heart. Joey is very Zionistic, but more importantly, believes in each individual’s rights to their personal freedoms, with a particular emphasis on freedom of expression. To that end, Israel at Heart endeavors to bolster the reputation and public perception of Israel by sending young ambassadors from Israel around the world to talk about their personal experiences. Many of these ambassadors are young, educated, driven, and remarkable Ethiopian Jews. However, on Israel at Heart’s most recent mission to the USA, one of Israel’s ambassadors was not from Ethiopia, but rather, Sudan; our close friend, Adam Bashar. For two weeks, Adam lived at Joey’s home in Westchester, along with Dina, Ruth, and Shlomit (three animated and beautiful Ethiopian-Israelis), and traveled around the state speaking to audiences about their experiences in Israel. On Sunday night, 16 ambassadors, who had represented Israel at Heart in Texas, Massachusetts, Georgia and Washington D.C., all reconvened at Joey’s home before returning to Israel. Christie and I spent Sunday afternoon at Joey’s home, speaking with the ambassadors and American supporters of Israel at Heart who had come to meet them. After lunch, the group assembled in the living room to hear each ambassador discuss his or her experiences in the past two weeks. Each ambassador chose a highlight, and many of them discussed the profound effect they had on audiences ranging from African American high schools, to Muslim community centers, to Jewish Hillel houses and beyond. They felt as if they had built bridges between communities and fostered cross-cultural understanding that wasn’t previously there. Overall, Christie and I left feeling educated about Israeli society and Ethiopian Jewry, and inspired to continue our mission; using The Last Survivor as a way to engage communities in local philanthropic action. Not to mention, we also made some great new friends. I cannot sum up this blog post without mentioning that Monday evening, we continued to learn more about Ethiopia. Christie and I attended a screening at Tribeca Cinemas hosted by the Joint Distribution Committee, of a short documentary called Making the Crooked Straight. This film highlights the incredible work of Dr. Rick Hodes, a doctor from Long Island who has spent the last 20 years helping the sickest and most destitute people living in Ethiopia. I highly recommend this film, which is airing on HBO and HBO on demand over the next month. So…it has been an incredible week thus far. I have learned a lot and realized once again that there is no shortage of good causes to support in this world. So here’s a funny story: back in January during New York’s snow Armageddon, I was stuck at the San Antonio airport waiting to get home. I was biding time during an extensive delay at an airport bar nursing a beer and started making idle chit-chat with the guy next to me – also trying to get home, also delayed. We got up to the part where I tell him what I do. “Documentaries, huh?” Was his response. “I was interviewed for a documentary a couple of years back, but I got left on the cutting room floor as they say.” He gave me an elbow nudge to let me know he was in on my industry’s lingo. Turns out he was pretty interesting. Apparently, he was stationed on a construction job of sorts down in Antarctica for some period of time and the filmmaker he was casually referring to was Werner Herzog. And this film he got edited out of was Encounters at the End of the World – perhaps my favorite documentary of the last 10 years and the film that, after 4 years of musing and brainstorming, inspired me to actually go down to Peru and start making Web. In the opening moments of Encounters at the End of the World – a 2008 documentary about adventure and Antartica – the director, Werner Herzog, makes clear that his interest in Antartica is different from other filmmakers who have journeyed to the ice continent in the past. Specifically, he tells us he is not going there to “make another film about penguins.” Herzog’s questions, he insists are different: “Why is it,” he asks, “that human beings put on masks or feathers to conceal their identity? And why do they settle horses and feel the urge to chase the bad guy?…Why is it that a sophisticated animal like a chimp does not utilize inferior creatures? He could straddle a goat and ride off into the sunset.” At its heart, Encounters questions why some of us feel that innate need for adventure, to leave the world behind and chase our passions. It is also, in the end, a film about penguins. The Antartica Herzog find is one that has already been explored. The camera moves across the continent, introducing the viewer to those who have come from all over the Earth to this final frontier of ice. And while Herzog is clearly enamored with the eccentricity of his subjects, his larger point, it seems, is that we have run out of space to run. The landscape in Antartica is dominated by bulldozers, ice cream machines, even an ATM. And the outlook doesn’t get much better from there. The researchers Herzog speaks with along his journey confirm what most of us already know in our gut: the Earth has had about all it can take of us – the ice caps of Antartica are beginning to melt away and our own inhabitance of the Earth is doomed to go with them. And so, delivered with this fatal blow, the film takes on the feel of a time capsule of sorts as Herzog asks the viewer to see our species from the perspective of future “alien researchers coming to see what we were doing at the South Pole.” He takes us on a tour of the ice tunnels that lead us under the South Pole. The tunnels themselves are marked with the seal of the American government, letting the alien researchers know we were here first. And, at the mathematically precise spot that marks the South Pole, is a frozen fish we have left behind to be preserved for eternity by the tunnel’s extreme temperatures. “We have been everywhere on this planet,” the frozen fish says. But Herzog hasn’t finished with his questions. With no room left to explore, why is it that some of us still insist on leaving everything behind and clinging to the small remnants of the unknown we have left? The answer comes in what will remain among my favorite cinematic moments of all time: a penguin running steadfastly across Antartica’s plains of ice into the mountains. Some sort of wiring in the penguin’s brain has gone haywire, we learn from a researcher. It’s not common but happens from time to time. 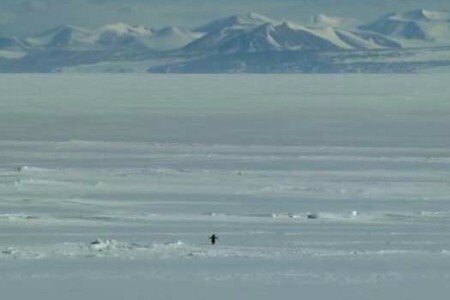 One day it seems, without warning, a penguin will begin to run inland with no clear direction. The fate of these AWOL penguins is definitive and unforgiving, they will die alone in the mountains. That is the image we are left with. That penguin, insisting on going against every evolutionary instinct in its body, fleeing his flock and his world, stumbling over his own steps toward certain death. And yet it keeps on running. I’ll be using this space once a week to write about movies that move me. I’ll usually try stick to films I watched during that specific week to keep things current. But as I start, Encounters seemed rather apt. Every Monday (I should say, hopefully every Monday) I will be exploring the subject of ART AND SOCIAL CHANGE. Specifically, how are artists and storytellers using their artistic mediums to raise awareness and inspire change? Quite fortuitously, just in time for the first installment of this new blog, the 2011 TED Prize winner JR (infamous street artist) just unveiled his TED Prize wish: To use art to turn the world inside out. JR can say it far better than I, so I encourage everyone to watch the video below of his speech, but I will say just a few words for those of you unfamiliar with the TED prizes or JR’s work. Since 2005, the TED prize has been awarded annually to an exceptional individual. The lucky recipient receives a $100,000 monetary prize and more significantly, “one wish to change the world,” with the commitment from the TED community to leverage their talent, resources and network in order to help make this wish come true. Previous winners include Bill Clinton and Jamie Oliver, JR is the prize’s youngest winner. In his TED talk, JR posits that art is not supposed to change the world, but rather, to change perceptions. JR’s TED prize wish, a massive humanist art project, speaks to this sentiment exactly, that what we see changes us, changes who we are. And so, JR asks that we each stand up for what we care about by participating in a collaborative, global art project. This massive undertaking attempts in many ways to take the power back from the media. Anyone can participate in JRs wish by uploading a photo of yourself or a subject you are passionate about to www.insideoutproject.net and JR and his team will send you back a huge poster for you to paste somewhere. Together we can start changing the world, one photograph at a time. Stay tuned for Part II of this blog as I document the RP team’s endeavor to heed JRs wish! - You can visit JR’s website here. - To participate in JRs wish, visit http://www.insideoutproject.net. Yes, Groundwork has everything a coffee drinker could want. One could therefore imagine the level of excitement that overwhelmed the Cattaraugus duo on the first day of Big Edit when a Venice Groundwork location was discovered. Set on the relaxed corner of 7th Ave and Rose in Venice, the Groundwork Flagship store is a coffee-lovers heaven. Easily three times the size of the Santa Monica location (which is admittedly cramped), the Venice Groundwork is a self-serve styled coffee shop, offering iced coffee a Michael can pour himself, fresh and innovative biscuits, and an enjoyable atmosphere just minutes from the beach. However, in Big Edit’s spirit of collaboration, the two Michael’s eased tensions last week when an unlikely collaboration between master and protege lead to what critic’s are calling a creative re-invention of RPLA’s culinary offerings: The California Morning Sunshine. A perfect combination of the two Michael’s individual talents – Pertnoy’s legendary eggs over easy and Kleiman’s exotic melted swiss cheese and avocado combo – the California Morning Sunshine features an egg perfectly fried over easy atop a slice of whole toast topped with fresh California avacado and melted swiss. A splash of spicy Harbonaro sauce is thrown in between the cheese and the egg for the more daring clientele. And all is topped off with a sprinkling of Paremesan cheese. “It was very organic,” Pertnoy said of the combination. “I had been telling him he can’t make anything other than toasted bread with swiss cheese and avocado and he had been complaining that I only make eggs over easy. So we decided to combine them.” “It was the smartest idea either of us had ever had,” said Kleiman. However, Randal Jennings, a made-up Culver City resident and frequent RPLA patron was underwhelmed by the announcement. “I’ve been making these things for months,” says Jennings, who since November has been ordering Kleiman’s swiss cheese toast and Pertnoy’s eggs separately and then combining them. That’s it for This Week, join us next week for a full report on “Really Big Edit Week”, the continued collaboration in the RP kitchen, and a fresh jug of Groundwork coffee.